Kulcha Recipe – a type of leavened bread is probably one of the most popular Flatbread in India and Pakistan after Naan. Kulcha is a typical Punjabi recipe. Amritsar, a city in Punjab, is famous for its Amritsari kulchas or Amritsari naan. 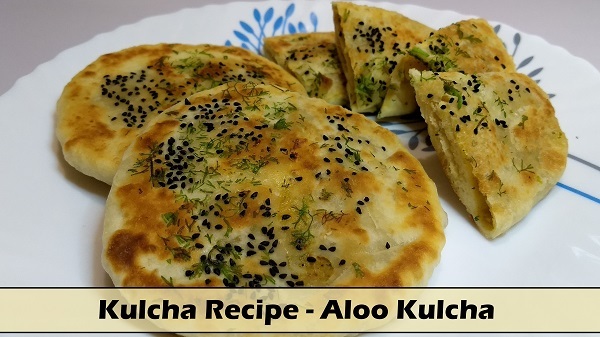 Today I am sharing an easy recipe of Aloo Kulcha / Stuffed Kulcha. Made from refined flour (Maida) stuffed with Potato mixed with spices to enhance the taste. Naan uses Yeast as a leavening agent whereas Kulcha is made using Baking Powder and Baking Soda. Kulcha typically cooked in the tandoor, but I have cooked it on Tawa. Learn how to make delicious Stuffed Kulcha / Aloo Kulcha at home without Tandoor. In a large bowl, add All Purpose Flour, Powder Sugar, Baking Powder, Baking Soda, Salt, Oil and Curd, mix well all ingredients. Add water as required and prepare the soft dough. Cover with lid and keep it aside for 2 hours. In another bowl, add boiled, mashed Potatoes, Ginger paste, Green Chillies, Garam Masala, Red Chilli Powder, Cumin Powder, Turmeric Powder, Chat Masala and some chopped Coriander. Mix well all ingredients and keep it aside. After 2 hours, add some Clarified butter in the dough and gently knead. Prepare medium size balls from the dough. Add Salt in Potato stuffing and mix well. Make sure you add salt just before preparing Kulcha. Roll the dough balls into Rotis. Add some Potato stuffing in the centre of Roti and wrap it with sides of the circle and seal the edges, give it a round shape like a ball. Press gently, so that stuffing spreads evenly. Sprinkle some Kalonji Seeds and some chopped Coriander on the stuffed dough ball. Roll it out gently into thick Roti. Spread some clarified butter on Tawa using tissue paper. Cook Kulcha over the Tawa on medium flame. Flip over partially cooked Kulcha and apply some Clarified Butter on top, spread evenly and flip again. Cook till it turns Golden Brown. Repeat the process and prepare all stuffed Kulchas. Serve hot with Punjabi Chole, Curd or Mango Pickle.